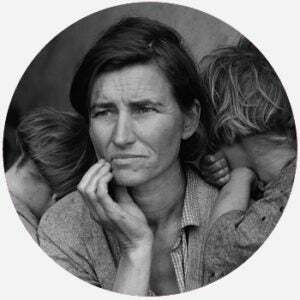 What does the Great Depression mean? The Great Depression was a severe, global economic depression lasting from 1929 to approximately 1939. Where does the Great Depression come from? The Stock Market Crash on October 29, 1929, dubbed “Black Tuesday,” is generally considered to be the start of the Great Depression. A few smaller crashes and recessions had preceded the big crash, particularly one in the summer of 1929, but none lasted so long or fell so far. Speculation, partly induced by the rapid expansion of the US economy, had led to a correspondingly rapid expansion of the stock market. Stock prices rose much higher than their real value, and other economic stresses, such as low wages and environmental drought, came to bear. Inevitably, the speculation crashed, and the prices of stock fell very low, creating massive panic. While the timing and severity at which it hit other countries varied, the Great Depression was a worldwide phenomenon. Previous economic crises were generally not so widespread, being confined only a few nations at a time, but during the Great Depression, international trade suffered in many countries. In 1932, it was estimated that about 30 million people worldwide were unemployed. The global nature of the crisis was partly the result of trading policies and of the strong link between currencies that World War I created. Among the many global effects of the Great Depression was Hitler’s rise to power in Germany, which was hit nearly as hard as the United States. Back in the United States, banks began to close after the stock market crash. Since many banks held some of their assets in stock, the sharp drop in prices made the value of those assets plunge very quickly. Many were forced to close, and 11,000 of the 25,000 banks in America were out of business by 1933. Bank failures only increased problems created by low employment and low wages brought on by decreased demand. Unemployment rose to above 20%, and even those who had jobs often couldn’t support their families. Government response was initially small, with only a quarter of unemployed families receiving aid and only 1.5% of government spending going towards aid. Roosevelt’s extensive New Deal program helped ease the suffering of the poorest citizens, including the development of Social Security and public works programs that transformed the modern US government. However, the US did not fully pull out of the Great Depression until it entered World War II. Because the Great Depression was so severe, it is often used as a point of comparison in economic analysis. For instance, the 2008 recession has often been called the worst economic recession since the Great Depression.